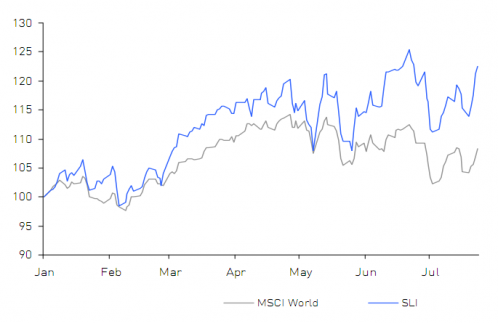 The Savigny Luxury Index posted a solid overall gain of 22.4% since the beginning of the year, outperforming the MSCI World index by 19 percentage points. The overall sentiment was that the sector is on the rebound, with Bain forecasting a four percent rise in sales for the sector for 2010. Q1 results posted by our universe of companies showed both strong sales and profit growth. Nevertheless the overriding message was one of cautious optimism with some of the sales growth in Q1 being attributed to retailers restocking depleted inventories. Some concerns were raised as to whether LVMH powerful Q1 growth, which sent its share to a 10-year high, would be sustainable for the whole year. Signs of improved prospects for the sector continued to come out of company and sector announcements. Swiss watch exports posted a healthy increase in June, and Hermès lifted its full year sales growth target on the back of surprisingly strong Q2 figures released on 20 July (27% growth for the quarter or 20% at constant exchange rates). The overall view is that more good news is to come, underpinned by strong demand in emerging markets, especially China, and by the recovery of demand in the USA, which should continue to prop up wholesale channels. LVMH recently released half year results confirmed the trend, beating estimates with a 16% growth for the first semester. Has the Aegean brew poisoned the equity well? The Greek sovereign debt crisis which unfolded at the end of April sent global markets into turmoil. The SLI was not immune and went into a tumble, losing eight percent of its value from end-April to mid-May. The respite of the rescue package announced at the beginning of May was short-lived, with the fear of Aegean contagion to other markets such as Spain and Portugal resulting in another dip in early June. Whilst July saw both a strong recovery in the MSCI World index (+4.8%) and the SLI (+9.6%), there are lots of frayed nerves as a result of this macro-economic uncertainty. The luxury sector is setting sail again but the Aegean tidal wave continues to rock the fragile boat of recovery – the sails have been hoisted but will the boat capsize? This newsletter is distributed from time to time to clients and contacts of Savigny Partners LLP (“Savigny”) who are interested and professionally experienced in the luxury goods sector. The views and opinions expressed in this newsletter pertain to themes that are topical to the luxury goods sector as at the date of this newsletter, and are meant to stimulate open discussion between Savigny and its clients and contacts. The information in this newsletter has been compiled from sources believed to be reliable but neither Savigny, nor any of its partners, officers or employees makes any representations as to its completeness or accuracy. This newsletter is not intended to help its addressees or readers make investment decisions, nor does it purport to make recommendations regarding potential investment decisions. Savigny shall not be liable or responsible for any loss or damage caused by or arising from any reader’s reliance on information contained in this newsletter. Please note that some or all of the brands, and the companies which own brands, mentioned in this newsletter may have been and may continue to be clients of Savigny or may have a professional relationship with Savigny.